Hawaiian Tropic Lipgloss SPF 25 in Island Berry – (tube on left) it smells of berries, it tastes of berries, it’s shiny, it’s long-lasting, it’s not sticky, it’s tinted, AND it’s SPF25 and therefore PERFECT for when i’m outside. i love this lip gloss. it’s definitely one of my top two all-time favourite lip glosses. Skinn by Dimitri James Sheer Effects Smile Gloss in Million Dollar – (top center) this non-sticky gloss is meant to have teeth-whitening abilities (i think it’s got something to do with the blue tone in it) but my teeth are already pretty white so i don’t notice that part so much. it IS, however, a very nice gloss – it goes on well and smells of chocolate mint. it looks slightly obnoxious in the tube, but it’s actually got more sheen than colour, with a subtle sparkle that can enhance your favourite lipstick as well as simply wearing it on its own. Burt’s Bees Lip Shimmer in Raisin – (bottom center) this ispretty highly pigmented so during the day i use it sparingly and save a full application for night time and going out. it’s not drying, and it has that trademark Burt’s Bees Tingle… and yaknow, for the record, i was using burt’s bees stuff long before it became trendy and hip. 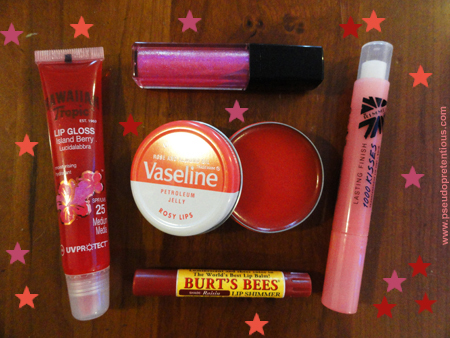 Vaseline Rosy Lips – (dead center) this is the other one of my top two all-time favourite lip glosses. i can’t say enough about this. it’s just lovely. there are rose and almond oils in it and it’s tinted and you can use it on cheeks and eyes as well as lips and it comes in a FABULOUS little retro tin. it has a light texture and goes on smoothly. i’m on my 5th or 6th tin now, but that’s only because i’ve been using this for a couple of years. one tin lasts quite a while. This entry was posted in makeup and tagged burt's bees, hawaiian tropic, lip gloss, rimmel, skinn, vaseline. Bookmark the permalink.